Take a look around you, and I bet you will see at least two objects in the room that you can control with a remote. In fact, there is probably more than one remote controllable device in every room of your home. Sure, there are universal remotes available for under $10 that you can put in each room, and even fancy touchscreen remotes that can control every device in your house, but what if you could use your iPod Touch or iPhone? 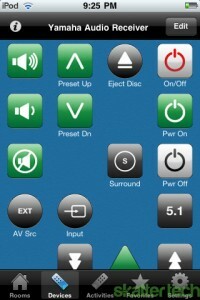 The NewKinetix Rē iPhone & iPod Touch Universal Remote Control does just that. Plug the infrared (IR) dongle into your iPod Touch or iPhone, download the Rē app from the iTunes App Store, choose from the thousands of pre-programmed devices, and you are ready to control every device in your house with a slick touchscreen interface. 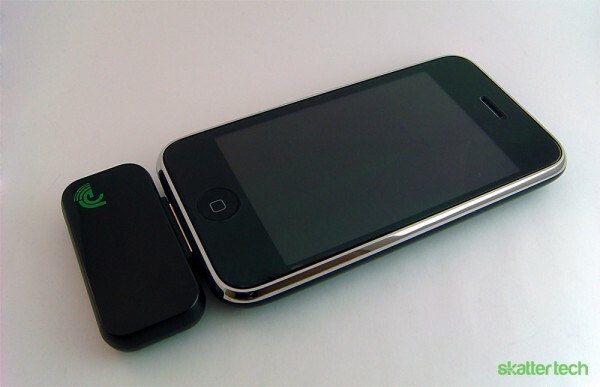 The Rē is a hardware dongle that allows your Apple iPod Touch or iPhone to control IR devices without any extra receivers or connections. Unlike other remote controllers, the Rē does not require any extra batteries and relies solely on the iPhone’s built-in rechargeable battery. It is, however, easier to lose than most remotes because of its compact size, but the included bright green case should help to prevent that. At about 2.5cm x 5.5cm x 1cm (not including the plug), it sticks out about an inch when plugged in and is no wider or thicker than the iPod Touch or iPhone itself. 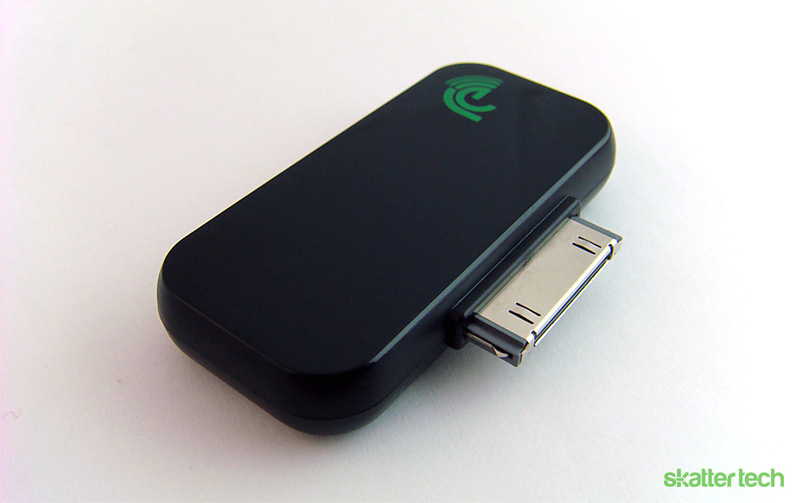 The dongle blocks the device’s audio port, so listening to music through external speakers or headphones while using the Rē is not possible. Although the light plastic attachment appears to be cheap at first glance, it is actually quite durable and fits securely to your iPhone without the use of a locking device. The design is a little disappointing considering the purpose and price; a small, green Rē logo lays atop a glossy black surface without any lights, screens, or LED’s to distract from the elegant software interface. The Rē software is available for free on the iTunes App store, but the 3.1 update is required for the iPod Touch ($4.95 US). The software will guide you through creating Rooms, then adding Devices to each Room. Adding a Room is as easy as choosing a name, like “Living Room” or “Ian’s Bedroom”, but the process of adding devices is sometimes easier said than done because there are so many customizable options and no search function. 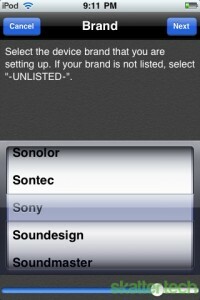 Adding a device involves scrolling through a long list of brands and then a list of device types. If there is more than one IR code for that brand and device type, the software will test each code until it finds one that works with your device. While this beats flipping through an incomplete table of device codes, and then programming and testing each individual code until one works, a search function would be an extremely useful addition. At this point, the software knows every device in each room in your house, and has created separate remotes for each. While switching between Devices is as easy as sliding a finger across the screen, it would be useful to have a single layout that knows to turn the volume up on your stereo receiver, change the channel on your cable box, and set the proper input on your television. This can be accomplished by creating an Activity – a layout designed to work with multiple devices in the same room. 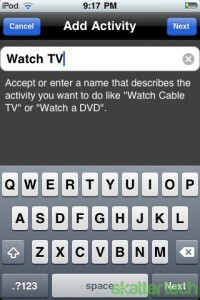 Activities can be created for any purpose your devices serve, like watching cable TV or playing DVD’s. Setting up an Activity for watching TV took a grand total of 43 seconds. I chose the devices I wanted to use (a cable box, TV, and audio receiver), and then designated devices for audio, transport, on-screen menus, channel changing, and picture-in-picture. Though it only takes a few minutes to configure most popular brands’ devices, it can be difficult to get the Rē to work with devices absent from the Pre-Programmed Device database. In that unlikely event, you cannot manually enter the IR code, but there are a few ways to get by. First and foremost, the NewKinetix support team responds to emails and forum posts quickly. If the device is not listed and they do not have a work-around, they may be able to add it to a future update. 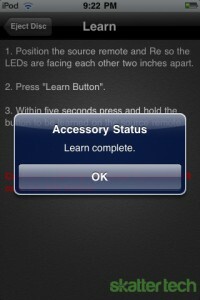 After that, the most direct method is have the Rē “learn” the codes from the device’s original remote, button by button. 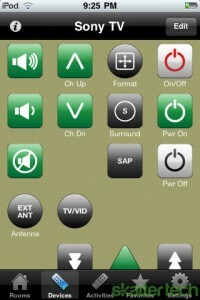 This is done by placing the original remote near the Rē’s receiver, and pressing the desired button on the original remote while the software is set to “learn” the code. 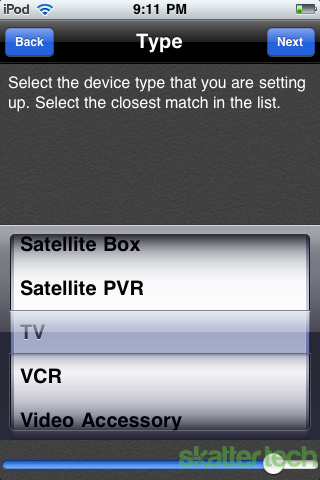 This method is also useful if a particular button is not functioning properly on a pre-configured device. 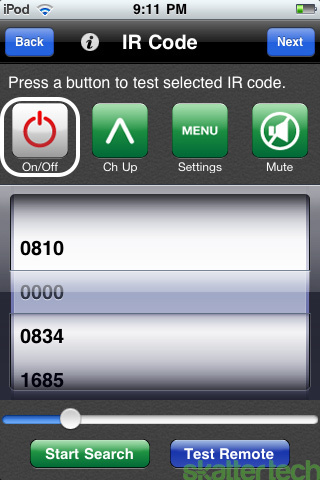 While a little time consuming, the Rē was able to successfully learn the IR code of every remote I threw at it. 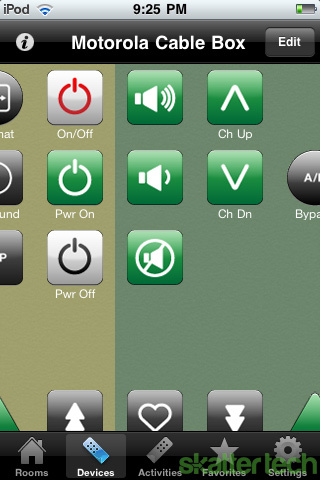 If “learning” each button from the original remote is too difficult or the original remote is missing, desperate users could try looking through alternate device types and brands. 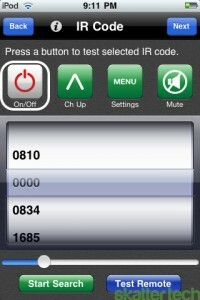 Often, other IR codes will work with your device even though they are not filed in the proper area. 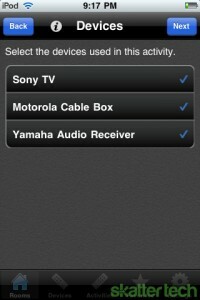 For example, I was able to configure the Rē to partially work with my Xbox Classic (running XBMC) by using the RCA DVD player code 0158. As one might imagine, the process of finding the right IR code out of thousands took an absurd amount of time. Rē should seriously consider adding a search function to their device list for the users who are not stubborn enough to manually go through every possible code. 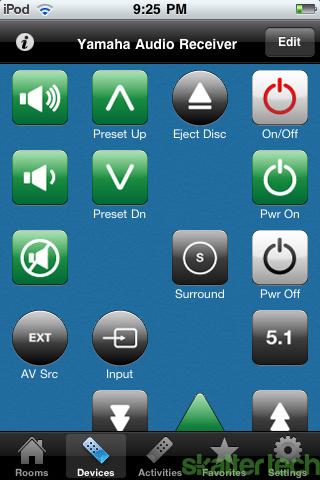 As if having a custom Activity layout to control every Device in every Room weren’t handy (though sometimes complicated) enough, the Rē Remote Control software has a number of useful features that set it apart from even the most expensive touchscreen universal remotes. 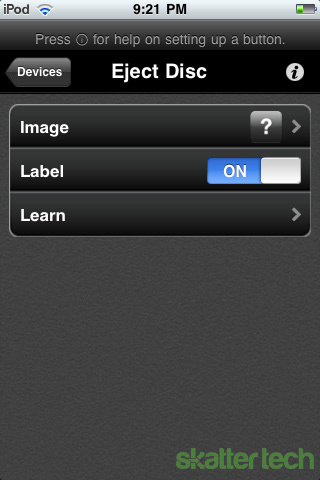 Macro buttons can be set up for each Activity to automate sequences of button presses. For example, a macro for playing a game on an Xbox 360 could turn on all the necessary devices, switch the TV to the proper input source, turn down the volume, and even log into a Live profile. Macros make it easy to teach young children and guests to use a complicated home theater, and to help grandma watch her afternoon soap operas without having to call her grandson in a panic. 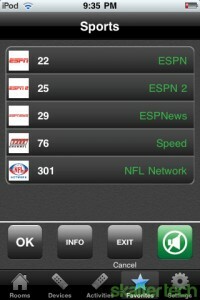 In addition to macros, lists of favorite channels and radio stations can also be created for each Activity. 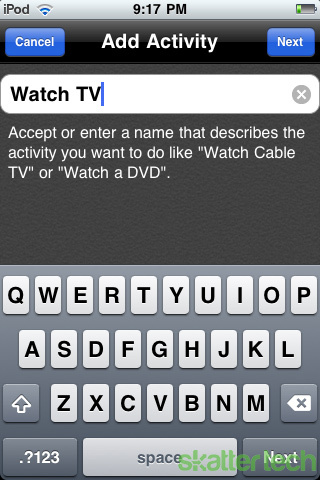 For example, you can create a list of sports channels and a list of movie channels for your “Watch TV” Activity, and a list of alternative rock radio stations for your “Listen to the Radio” Activity. Like Devices, Activities, and Rooms, you can have as many Favorite lists as you need. As an added bonus, you can assign pre-defined logos to your favorite channels. In the two weeks I’ve had this product, the Rē software has already released a major update that pushed hundreds of new devices to the Pre-Programmed Device database, along with new and useful features. Considering the software was only just released in March, the May update alone is a good sign that NewKinetix’s is committed to keeping their software as bug-free, up-to-date, and feature-packed as possible. 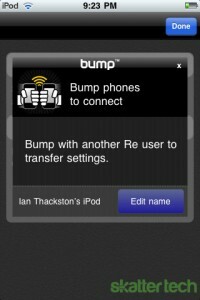 The Rē application now uses Bump technology to share settings between iPod Touches and iPhones, so a single Rē dongle can be shared without recreating every customization. With the application installed and the Bump Settings running, just lightly collide the two devices, and Bump will use the timing and geographic location of the collision to pair the devices and transfer settings. Before the update, the screen auto-locked according to the iPod Touch or iPhone’s general preferences. This was beyond irritating – I either had to make it so my iPod Touch had a long auto-lock time, or deal with unlocking the iPod every time I wanted to change the channel. Now, the auto-lock time can be customized within the application, along with key vibration and volume settings. 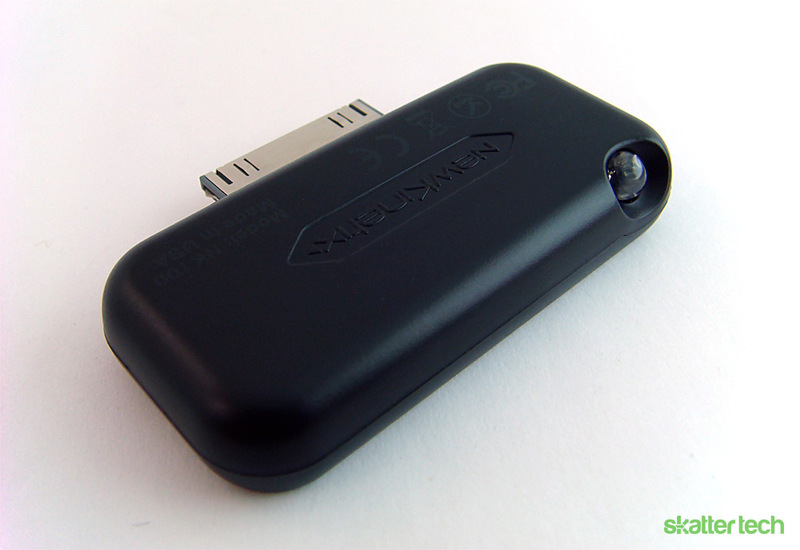 In addition, the screen will automatically go blank after thirty seconds to conserve power, and turn back on when you move or touch the device. It’s tough to quickly determine which Device or Activity is open, especially when the full screen mode is activated and the name is not displayed. 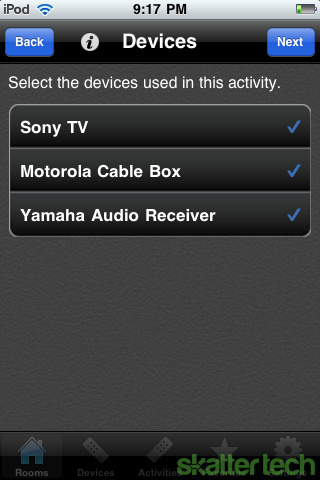 A new feature allows users to customize the background color for each Device and Activity to help distinguish between different remotes. Like anything that is as customizable as the NewKinetix Rē iPhone & iPod Touch Universal Remote Control, the setup is as complicated or as easy as you choose to make it. An avid TV-watcher can program every task to a macro, make a list of favorites for every channel, and carry the Rē from room to room to control every cable box, stereo, and coffee maker that has an IR receiver. At the same time, a technologically challenged retiree can have basic universal remote functionality without deciphering foreign manuals and huge tables of IR codes. The Rē works exactly as advertised: it’s straightforward, organized, robust, and useful. The feature set puts the remote on par with similar touchscreen universal remotes and pushes the envelope with the iPod Touch and iPhone’s large, responsive touchscreen, thorough updates, and an effortless yet highly customizable setup. The $70 (US) price tag is frequently cited as a deal-breaker and understandably so; all that’s included in the package is a small, unexciting plastic box with a neoprene case. 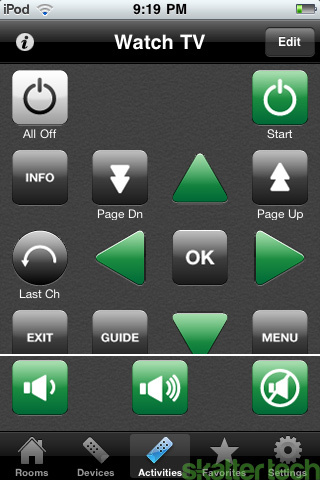 But when comparable products can cost hundreds more and still fall short in quality, it becomes clear that the NewKinetix Rē iPhone & iPod Touch Universal Remote Control is well worth the money. Great review! Thank you for taking the time to really understand and use the features of the Re. I have one question about the search feature you ask for. 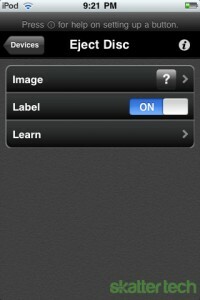 Is it different from the IR code search (Start Search Button) that appears in the 3rd photo under Setup and Ease of Use? Hi Barry! I meant it would be handy to have a way to search for brand and type, rather than scrolling through the long lists. A filter box above each list would do the trick. Great trick about using RCA DVD code 0158 for the XBOX if there actually was a code 0158:( Running the latest 1.1. What Am I doing wrong o-b-juan k’obe? Hmmm. Must be a type. I agree that code doesn’t exist. Do any of the XBox codes in the database work with the Xbox classic? There are 3 or 4 codes listed for various XBox device types. The code has disappeared from mine as well. However, the code did not work 100%, so I still had to learn most of the buttons from the original remote. 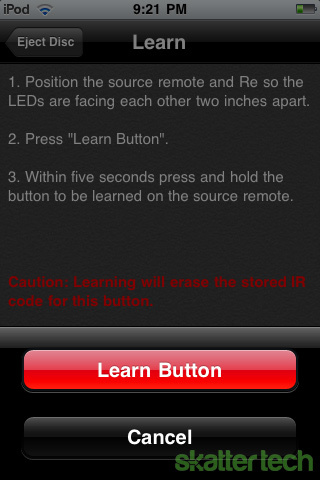 “The learning function copies the IR signal from your old remote into the button you created on the Rē. 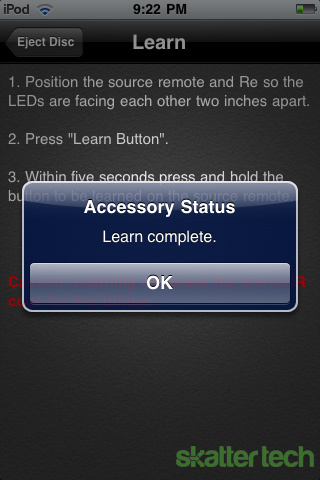 Learning is primarily used to add a special button to the Re remote for your device that wasn’t included in the database, as in this example. Also try adjusting the separation for better signal capture. You may find some lower power remotes need to be closer to the Rē for the best learning results. You will see the message at the right when learn completes. NOTE: The 30 ̊angle of the LED allows for comfortable positioning and better screen visibility during use. You can then test the learned function by pressing (Test Button). Sometime even though learn completes without an error, the learned code may not work. Verify the alignment of the IR diodes and try again. 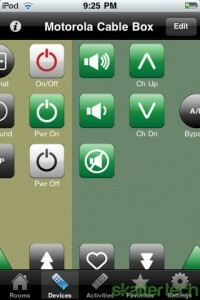 Adjust the positions to find the best alignment for the remote you are learning. I’d just like to verify the ‘ease of use’ and value for money as per Ian’s original review. I’ve had the RE for over 2 months now and find it super convenient and easy to use. The new option to customize the screen background is also a huge plus as I also found it a little confusing as to which device I was controlling at any one time. On a more day-to-day level, the RE has already made life simpler. Out babysitter told us she’d given up getting any TV shows or DVD movies at our place. Now when we go out, we just give her our RE dongle and bump iPhones to share our settings! She’s about to order her own RE after using ours – great news for all babysitters everywhere! Now I’m even happier that I opted for the Re from New Kinetix esp. now that the Redeye Mini has developed ‘issues’. Another vilification for me that I made the right choice going with the Re. I’ve since up’d to v1.1 and love the screen customization settings. Anyone else got 1.1? Great choice in buying the Re. I wish I had not purchased a RedEye Mini. I spent four hours trying to set it up and never got my TV to completely work. Then the next day the RedEye Mini completely ceased to operate, and mine is a post recall version. Maybe they haven’t yet got the bugs worked out. But even if they do, the user interface is terrible. Buy a Re!